FORT WORTH, Tex. – It was a case of déjà vu for Johnny Sauter on Friday night at Texas Motor Speedway. Now the defending NASCAR Camping World Truck Series champion hopes history repeats itself two weeks hence, when he races for his second straight title at Homestead-Miami Speedway. After taking over the lead on Lap 135 of 147 of the JAG Metals 350 Driving Hurricane Harvey Relief, when John Hunter Nemechek ran out of gas while leading at the end of a cycle of green-flag pit stops, Sauter kept fellow Round of 6 Playoff driver Austin Cindric behind him and crossed the finish line .170 seconds ahead of his closest pursuer. Sauter had passed Cindric for the lead on Lap 109, charging around the outside of the No. 19 Ford into Turn 1. The drivers ran 1-2 until they pitted on Lap 117 to start the pit stop cycle. Attempting to stretch fuel mileage, Nemechek ran out of gas 12 laps short and saw his championship hopes dim considerably. 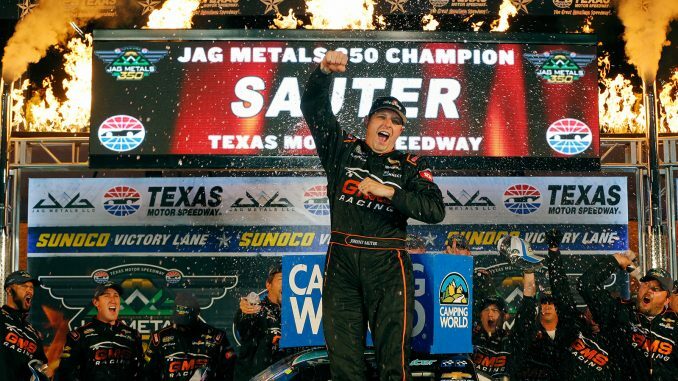 Sauter won the Playoff race at Texas for the second year in a row and the fourth time overall. With his third win of the season, he raised his career victory total to 16 in the series and guaranteed a run for the title at Homestead. Series leader Christopher Bell ran third, followed by Chase Briscoe and polesitter Justin Haley. Sauter said after the race he would like to think the season is following the same course as last year, but he’d prefer to stay in the moment. The 19-year-old Cindric felt he ran the best race of his career on a mile-and-a-half track, but he couldn’t find a way around the 39-year-old Sauter at the end. “I think it was youth versus experience tonight, and experience won, in more ways than one,” said Cindric, who moved into fourth place in the standings with the cut to four Championship 4 drivers looming next Friday at Phoenix. Bell owns a four-point lead over Sauter in the series standings, with two-time champion Matt Crafton 31 points back in third. Trouble on a late pit stop dropped Ben Rhodes to 18th at the finish and out of the top four in the standings. Nemechek ran 19th and, for practical purposes, must win next Friday at Phoenix to advance to the Championship 4 race. 1. (4) Johnny Sauter (P), Chevrolet, 147. 2. (6) Austin Cindric # (P), Ford, 147. 3. (3) Christopher Bell (P), Toyota, 147. 4. (10) Chase Briscoe #, Ford, 147. 5. (1) Justin Haley #, Chevrolet, 147. 6. (7) Kaz Grala #, Chevrolet, 147. 7. (19) Grant Enfinger #, Toyota, 147. 8. (5) Ryan Truex, Toyota, 147. 9. (8) Matt Crafton (P), Toyota, 147. 10. (2) Noah Gragson #, Toyota, 147. 11. (17) Austin Hill, Ford, 147. 12. (12) Myatt Snider, Toyota, 147. 13. (14) Regan Smith, Ford, 147. 14. (16) Stewart Friesen #, Chevrolet, 147. 15. (18) Austin Wayne Self, Chevrolet, 146. 16. (15) Cody Coughlin #, Toyota, 145. 17. (13) Tyler Young, Chevrolet, 145. 18. (9) Ben Rhodes (P), Toyota, 145. 19. (11) John H. Nemechek (P), Chevrolet, 145. 20. (26) Josh Reaume, Chevrolet, 139. 21. (21) Wendell Chavous #, Chevrolet, 138. 22. (28) Jennifer Jo Cobb, Chevrolet, 130. 23. (29) Norm Benning, Chevrolet, Brakes, 92. 24. (24) Jordan Anderson, Chevrolet, Power Steering, 70. 25. (30) Ted Minor, Chevrolet, Engine, 41. 26. (23) Patrick Emerling, Chevrolet, Accident, 24. 27. (20) Gray Gaulding(i), Chevrolet, Electrical, 23. 28. (27) Ray Ciccarelli, Chevrolet, Electrical, 21. 29. (25) JJ Yeley(i), Chevrolet, Electrical, 18. 30. (31) Mike Senica, Chevrolet, Oil Pressure, 8. 31. (22) Joe Nemechek, Chevrolet, Vibration, 7. 32. (32) Tommy Joe Martins(i), Chevrolet, Accident, 3. Average Speed of Race Winner: 131.38 mph. Time of Race: 01 Hrs, 40 Mins, 42 Secs. Margin of Victory: 0.170 Seconds. Lead Changes: 11 among 10 drivers. Lap Leaders: J. Haley # 1-25; C. Bell (P) 26-37; M. Crafton (P) 38-42; M. Snider 43-63; N. Gragson # 64-72; A. Cindric # (P) 73-108; J. Sauter (P) 109-116; C. Briscoe # 117; C. Bell (P) 118-125; G. Enfinger # 126; J. Nemechek (P) 127-134; J. Sauter (P) 135-147. 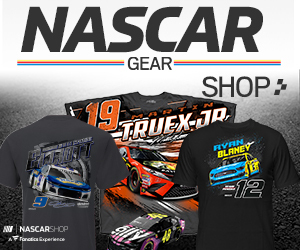 Leaders Summary (Driver, Times Lead, Laps Led): A. Cindric # (P) 1 time for 36 laps; J. Haley # 1 time for 25 laps; J. Sauter (P) 2 times for 21 laps; M. Snider 1 time for 21 laps; C. Bell (P) 2 times for 20 laps; N. Gragson # 1 time for 9 laps; J. Nemechek (P) 1 time for 8 laps; M. Crafton (P) 1 time for 5 laps; G. Enfinger # 1 time for 1 lap; C. Briscoe # 1 time for 1 lap. So what’s a 200 mph lap at Texas like?